The employment statistics for August 2012 were released last Friday. As usual, the statistical measure that interests us is not the unemployment rate but the Labour Force Participation Rate (LFPR) (see chart from the Bureau of Labor Statistics below). The LFPR enables us to derive a long-term pattern which is shown as the blue trend line on the chart. The August 2012 LFPR of 63.5% is the lowest since September 1981. 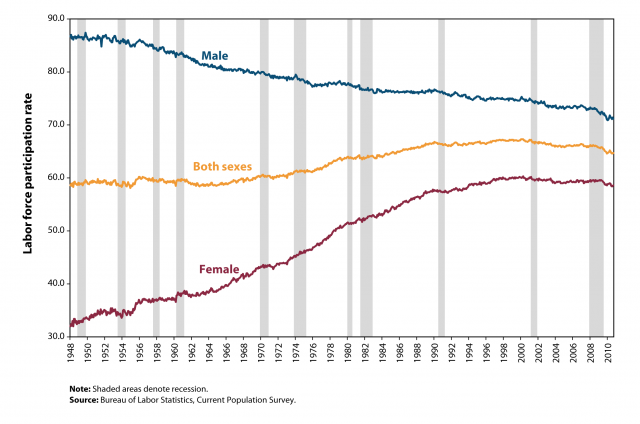 But the LFPR in 1981 was on an upward trend, a reflection of the mass entry of women into the workforce which had started in a big way during World War II when the menfolk was on the frontlines of war (chart below). This economic dividend is now gone. Both genders are now hard hit by the LFPR reversal as businesses make do with fewer employees, a consequence of technological progress and outsourcing. All the rules that used to govern the relationship between unemployment and GDP (Okun's Law), inflation (Phillips Curve), and job vacancy (Beveridge Curve) are now rendered obsolete. But by squeezing their labour force, the businesses are tightening the noose around their own neck. As employees are increasingly retrenched, their ability to consume goods and services would be progressively reduced. The big businesses will soon be caught in a vicious circle of continually reduced demand feeding on continually reduced income. In the third world countries, it's been observed that there are proportionately more entrepreneurs than in the developed world. However this doesn't mean that they are more commercially driven; it's just that salaried jobs are hard to come by. So survival comes from being petty traders or doing odd jobs. Now retrenched workers in the developed world will face the same problem. The Fifth Kondratieff Wave is unlikely to create the kind of jobs that uplifted the lot of the workers on such a large scale as in the Third and Fourth waves. Everybody has to be on their own, probably trading, producing goods or services, or even growing food; blurring the lines between services, manufacturing and agriculture. In short, back to the days when every community is self-sufficient ... the days of feudalism.